It was a long day today, most of which was spent on my feet, walking up down and around. I lurched home and forced myself to drag the recycling and the garbage to the street and to hang up a load of wash. I'm not going to mention what supper was as I'm too tired to cook. I got the mail between hauling the garbage to the curb and going back to get the recycling. I figured I could toss the stuff I don't want into the bin right away. There was a plain white envelope I sort of recognized. Quickly, I tore into it. Inside was a piece of yellow legal paper on which was written, "I got this after doing my shopping and I won't use it. I think you probably can. Please accept and go get yourself something nice for Christmas. It's used like cash." I stood in the driveway in the fading evening sunlight. I didn't recognize the handwriting. I do need to get 3 small gifts yet. There is $40 on this. This came on the heels of the receipt of a Christmas bonus from my company. We broke even last year. We made just enough money company-wide to pay the bills and have money for initial operating expenses at the first of this fiscal year. At the November managers meeting, we were informed there would be no cost-of-living increase as that's tied to some government index that actually went down. There would be no merit increases. And there would be no bonuses. With offices having to lay people off and the company just making it through the first quarter, I understood. A bonus is, to me, exactly that, something I wasn't expecting. So, when Mike handed me documentation of a bonus to come to me, flabbergasted doesn't quite cover it. Then I get home and here is this. I was so overcome, I dropped the envelope and the note in the snow and then ran over it with the recycling container. It didn't photograph well at all. 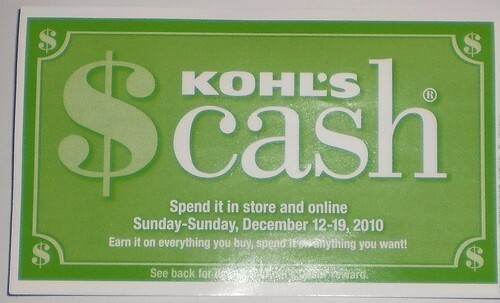 As this Kohl's cash expires on Sunday, I think I shall wander over on Saturday. Get something for myself. Well, I was looking at some of the socks I have. A few are really worn in the heels and darning them isn't an option anymore. I'll bet Kohl's would have some brightly colored long-sleeved knit shirts. I could use some red, gold or stoplight green ones. I changed the sheets tonight and I realized I have two top flannel sheets. 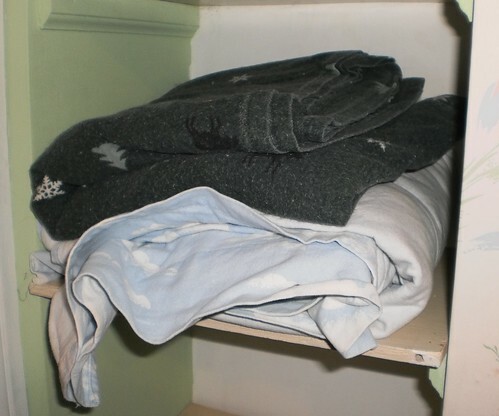 The bottom fitted sheets wore through in the center while the tops are still perfect. Maybe I could get a white flannel fitted bottom and I could use these. Decisions, decisions. To the person who sent this, thank you for giving me the opportunity to have to make this decision. I am so very grateful to you for thinking of me.